An Opinion On Sports: Whatever Happened to the 'Double Bar' Face Mask? 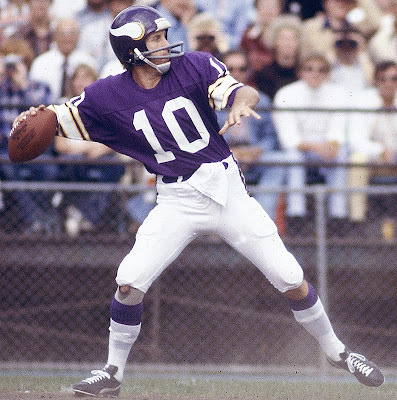 Fran Tarkenton is shown above sporting an old 'double bar' face mask on November 23, 1975 when he became the NFL's all-time completions leader with 2,840. The double bar was popular for backs and receivers during that era, primarily because that was the best choice they had. And you would have to admit, it was a step up from the single bar that proceeded it. You can see in the photo that there is still a lot of face open as opposed to today's guards that modern players wear, but the single bar wasn't much more than a handle with which to carry the headgear with. It's a very good thing that both the helmet and the face mask have advance so far, because the game itself has advanced just as far with quicker, faster, and stronger participants. The best facemask style ever. Should be brought back. The "evolution" of helmets, shoulder pads and masks has made the game more dangerous, not safer. Soft shell helmets and soft shoulder pads and the Riddell BD9 facemask should be standard to preserve the future of the sport. And one-platoon teams also.